The prestigious Centre for Technology Innovation at Brookings, in a new research paper, has found that India has had the highest number of internet shutdowns across the world, which led to an economic loss of $968 million, again the highest among the countries which resorted to internet shutdown as a political tool. In rupee terms, India’s losses would be Rs 6,582.95 crore. In fact, both in terms of the number of internet shutdowns and the amount lost, the study shows, India outpaces the neighbouring Pakistan, ironically known for considerably higher restrictions on democracy than India. Titled “Internet shutdowns cost countries $2.4 billion last year” and carried out by Darrell M. West, the study analyses the economic impact of 81 temporary internet shutdowns in 19 countries over the past year, from July 1, 2015 to June 30, 2016. 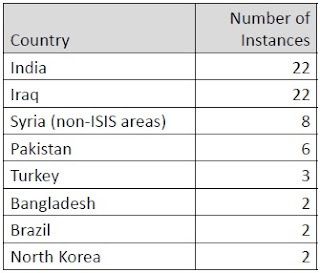 The study shows that India witnessed 22 internet shutdowns during the period, equal to that of Iraq (22), followed by Syria (non-ISIS areas) 8, Pakistan 6, Turkey 3, Bangladesh, Brazil, North Korea, Republic of Congo, Uganda, and Vietnam two each, and Algeria, Bahrain Chad, Ethiopia, Libya, Morocco, Saudi Arabia, and Syria (ISIS areas) 1 each. The 22 internet shutdowns in India were for a period of 70 plus days. The highest number of internet shutdowns was in Syria (non-ISIS areas) for 348 days, followed by Morocco 182 days. Pakistan had an internet shutdown for just 3 plus days and Bangladesh 25 days. Saudi Arabia, a closed country, saw an internet shutdown for 45 days, which is considerably less than that of India. West is vice president and director of Governance Studies and founding director of the Centre for Technology Innovation at Brookings. His studies include technology policy, electronic government, and mass media. Identifying their duration, scope, and the population affected, and estimated impact on Gross Domestic Product (GDP), West says following India’s loss of $968 million, it is “$465 million in Saudi Arabia, and $320 million in Morocco, and $209 million in Iraq." Then there was the loss of $116 million in Brazil, $72 million in the Republic of the Congo, $69 million in Pakistan, $69 million in Bangladesh, $48 million in Syria, $35 million in Turkey, and $20 million in Algeria, among other places, it says. Sourcing on what happened in Gujarat and Haryana, the study says, “In many other instances, regional Indian officials also ordered disruptions in response to public security concerns”. It cites how “India shut down mobile internet services in Rohtak on February 19, 2016 in response to street demonstrations in Rohtak and Jhajjar." “As long as political authorities continue to disrupt internet activity, it will be difficult for impacted nations to reap the full benefits of the digital economy. Every year, more and more consumers and businesses are engaging in e-commerce and online transactions”, he adds. West further says, “Internet disruptions slow growth, cost governments tax revenue, weaken innovation, and undermine consumer and business confidence in a country’s economy. As internet-powered businesses and transactions continue to grow to represent an increasingly significant portion of global economic activity, the damage from connectivity disruptions will become ever more severe.